finally, you can view the result, print it and export to many common document formats. FastReport.Mono is written in C# and contains only managed code. It is compatible with Mono Framework 2.0 and higher. Full source code is available. You can customize your copy of FastReport.Mono to match your needs. Reasonable price and licensing policy. Extendable FastReport.Mono architecture allows you to create your own objects, export filters, wizards, DB engines. If existing abilities are not enough for you - extend it! FASTREPORT®.MONO is a band-oriented report generator. There are 13 types of bands available: Report Title, Report Summary, Page Header, Page Footer, Column Header, Column Footer, Data Header, Data, Data Footer, Group Header, Group Footer, Child, Overlay. In addition, you may use subreports which are fully supported. Wide range of band types allows you to create any kind of report: list, master-detail, group, multi-column, master-detail-detail and many more. Wide range of report objects available: text, picture, lines, shapes, barcodes, matrix, table, rich text, checkbox. The Table object allows you to build a table-type report with variable number of rows and/or columns, just like in the MS Excel. Aggregate functions are also available. Powerful, fully configurable Matrix object that can be used to print pivot tables. Report inheritance. You have many reports with common elements such as titles, logos, footers? Put the common elements into base report and inherit all other reports from a base. 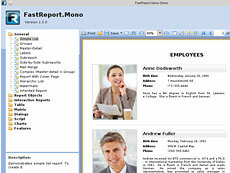 FASTREPORT®.MONO contains powerful visual report designer that supports zooming, undo/redo, guidelines, rulers. Report designer can be used in run-time, so you can give your users the ability to modify existing reports and create new ones. Report designer is run-time royalty-free. The Report Structure control visualizes the logical structure of your report. It helps you to better understand the report (especially if you are not its author). Standard Report wizard. Perform 5 steps and get well-shaped, ready-to-use report. Label wizard supports most of label types and helps you to create label report in a few mouse clicks. The report designer can be used in MDI (Multi-Document Interface) mode to allow work with several reports at one time. FASTREPORT®.MONO works with data from ADO.NET data sources. It has ability to sort and filter data rows, to use master-detail relations and lookup data columns. Everything can be done with a few mouse clicks. Direct connect to different databases. Ability to get data from business objects of IEnumerable type. Report can contain data sources (tables, queries, DB connections). Thus you can not only use application-defined datasets, but connect to any databases and use tables and queries right inside a report. FASTREPORT®.MONO has a built-in script engine that supports two .NET languages, C# and VB.NET. You can use all .NET power in your reports to perform complex data handling, manage the interaction with dialogue forms and many more. Report can contain dialogue forms to ask for some parameters before the report is run. Dialog controls have built-in data filtering feature that allows you to view the data from a report data source and filter it in a few mouse clicks without writing a line of code. Using visual query builder, you don't have to learn the SQL language to create a complex query from several data tables. Handy MS Word-style preview window. Ability to search text in the prepared report. Ability to modify the prepared report pages. Navigation in the preview window. When you design a report, you may define elements that will form a document outline. The outline will be displayed in the preview window. When you click an outline item, the preview will be scrolled to specified item. You also may define active items that will receive mouse clicks. It can be used to navigate to another report element or to external URL. Interactive reports. You can define an action that will be performed if a user clicks an object in the preview window. Rich printing abilities: cut big pages to several smaller ones, print several small pages on one big, print on specified paper size using scale. Add watermarks to your report with minimum efforts.